Good until Saturday night at 11:59pm eastern time, New York’s B&H Photo is offering the new condition Pioneer SE-MONITOR5 closed-back over-ears for $470 with free US shipping. They come with various cables and earpads, cellulose nano-fiber drivers, and a 1-year warranty. Good until Saturday at 11:59pm eastern time, you can get the new condition Pioneer SE-MONITOR 5 hi-res dynamic headphones for $500 with free shipping. They come with balanced and unbalanced cables and two different sets of earpads. These are closed-back. Good until Monday at 11:59pm eastern time, B&H Photo is offering the new condition Pioneer HRM-7 DJ/Studio headphones (closed, over-ears) for $99 with free US shipping. It comes with two sets of cables (obviously detachable) and a replacement set of earpads. These have the two level headband design. The new condition currently goes for $999 but it went for $761 a month ago. But if you are comfortable with use, you can shave off $170 off the then sale price. Okay, let’s start from the beginning. As of the time of writing, there is one unit available of the Pioneer SE-Monitor 5 headphones available in “Used – Like New” condition (damaged original packaging) going for $596~ with free shipping by Amazon Warehouse Deals actual. They have zero customer reviews. As part of the eBay coupon promotion running until Sunday 8am pacific, coupon code P20SAVENOW is a 20% off discount on purchases of $25+ with a maximum coupon discount of $50. The black color scheme of the Pioneer SE-CH5T in-ears are currently available in “Used – Very Good” condition (cosmetic imperfections, damaged original packaging) going for $28 with free shipping through Amazon Warehouse Deals. The new condition price is $40. They average 4.7 out of 5 based on a lucky 13 customer reviews. UPDATE: initially the blog-post title failed to mention they are used. It has since been corrected. We continue with the Amazon Warehouse Deals dive. Because of the price checking that goes with it, a Warehouse Deals dive surfaces both used deals and new condition deals. This is a new condition deal. All four color schemes of the new condition Pioneer SE-MS5T closed over-ears are going for $40 with free shipping, with up to three per color per customer. They average 4.1 out of 5 based on 30 customer reviews. This is not a lightning deal, so expiration time is unknown. The new condition closed-back over-ear Pioneer DJ HRM-6 studio headphones (yes, they have both buzzwords, “DJ” and “studio”) go for $169 in new condition, but if you want to save, you can get them in “Used – Like New” condition (original packaging) for $119 with free shipping by Amazon Warehouse Deals actual. The Pioneer SE-MS5T closed-back over-ear headphones go for around $50 in three of the four colors available, but if you are comfortable with used, USED prices start at $36~ in the black color scheme, and $39~ in the brown color scheme through Amazon Warehouse Deals. Sale time! The new condition Pioneer SE-MS5T closed-back over-ear headphones are on sale for $50 with free shipping in the brown-tan and black-silver color schemes at Amazon by Amazon actual. The red color scheme is on sale for $50 as well, but it’s in the mysterious “temporarily out of stock” status. The new condition Pioneer SE-MS7BT Bluetooth Over-ears go for $130 at authorized dealers, but if you are okay with used headphones, the brown color scheme is available in used condition starting at $88 by Amazon Warehouse Deals actual, with prices increasing for better conditions. They average 4.1 out of 5 based on 26 customer reviews. While no one was watching, Pioneer launched a new headphone, blessed with both “PRO”, “DJ” and “Studio” marketing, it is the closed-back over-ear folding Pioneer DJ HRM-5. It goes for $100 in new condition but it is available in “Used – Very Good” condition for $75~ or “Used – Like New” for $79~ by Amazon Warehouse Deals actual. There’s one listing for each condition mentioned above by AWD actual. It has one customer review that has two sentences in it. So plan ahead before you read it 😉 It has detachable cables and detachable pads (since there is a listing for official replacement pads for it, model HC-EP0402). The Pioneer XDP-100R DAP is currently on sale for $300 in new condition, but if you want to save more, you can get them in “Used – Like New” condition for $219~ with free shipping by Electronics Expo through Amazon Warehouse Deals. This is available in both black (previous link) and in silver color schemes. They ship directly from Electronics Expo (East Coast, not Prime eligible). They average 4 out of 5 based on 36 customer reviews. It’s bundle up time now. You get three different products for $70. The new condition closed-back on-ear Pioneer SE-MJ553BT-K bluetooth headphones, the Indigo portable headphone-amp (which looks a lot like this M-Audio ~ they both for $30 on their own), the Slappa hardbody headphone case (goes for $20 on its own). All these are by Beach Camera thru Amazon. It ships directly from Beach Camera (New Jersey) but if you are a Prime member, you get Prime-like shipping speed directly from Beach. On the other hand, if you don’t want the portable headphone-amp, you can a different bundle for $10 more: it replaces the amp with an omega-shaped wood headphone stand. PS: some of these bundles are value plays, you don’t necessarily have to (or you can’t) use all the items together, eg the portable head amp and a bluetooth-only headphone. DAP-DAP time! The new condition Pioneer XDP-100R is on sale for $300 in new condition in the black or silver color scheme by Electronics Expo (East Coast B&M retailer) with the orders fulfilled by Amazon, so you get free 2-day shipping if you are a Prime member. This averages 4 out of 5 based on 35 customer reviews and has nearly 60 questions answered. More questions than reviews can be a sign of a niche-interest in a product. The Pioneer XDP-100R is offered in open-box “Used – Like New” condition for $279~ with free shipping by Electronics Expo through Amazon Warehouse Deals in either the black color scheme or the silver color scheme. These ship directly from Electronics Expo. They also have a “fulfilled by Amazon” option that costs $20 more. Both come in original box with original accessories. The DAP averages 4 out of 5 based on 35 customer reviews. Bundle is the theme of the day it seems. This time we have the Sennheiser HD8 closed-back over-ear DJ headphones bundled with the Pioneer DDJ-SR 2-Channel Performance DJ Controller, all together going for $669 with free shipping at Adorama.com. The Pioneer controller on its own goes for $599. Here, we cover headphones big and small, from single figures to five figures. All is welcome. Which is why I love juxtapositions of these kind: a few posts after mentioning the $2500 Pioneer Masters, we have an $8 Pioneer headphone shipped! The closed-back on-ear Pioneer SE-MJ512-K goes for $8 with free shipping. The seller is “audio video sales guy” through Amazon. This ships directly from them. According to the seller description over there, their parent company is a single store Southern California location. While looking at the product description of the Pioneer Master SE-1, I discovered another new-to-me Pioneer headphone, it is the closed-back SE-MHR5 folding headphone. This has two separate listings at Amazon. Amazon’s own price is $201~, while in a separate listing East-Coast store chain Electronics Expo offers it for $190 with the order fulfilled by Amazon, so it is Prime eligible. I didn’t even know this headphone existed until I “ran into it” online, it is the Pioneer Master SE-1, in-stock and ready to ship for the flagship price of $2500 at Amazon by Amazon actual. Per the product description, this is “…assembled by a master specialist at the Tohoku Pioneer Plant, Yamagata Prefecture” (in Japan). The Pioneer XDP-100R-K digital audio player is offered in new condition for $300 with free shipping by Electronics Expo (East Coast B&M retailer) thru NewEgg and also through NewEgg Flash. This DAP has both 32GB of internal storage, and two microSD slots (up to 200GB cards per slot). A variety of features, including a built-in speaker, and a 720p touchscreen. This is an Android-based device with Google Play support and a Snapdragon Krait 400 quad-core processor with Adreno 330. Another bundle, of actual DJ interest perhaps, the Ultrasone PRO 900i headphones are bundled together with the Pioneer Electronics hannel Serato DJ Controller for $1000 with free shipping at authorized dealer Adorama.com as a limited time offer. No coupons, no rebates needed. The new condition Pioneer SE-M521 go for $27 with Prime shipping, or if you can wait for them to arrive from Japan, over a dozen sellers ship from Japan for around $22. 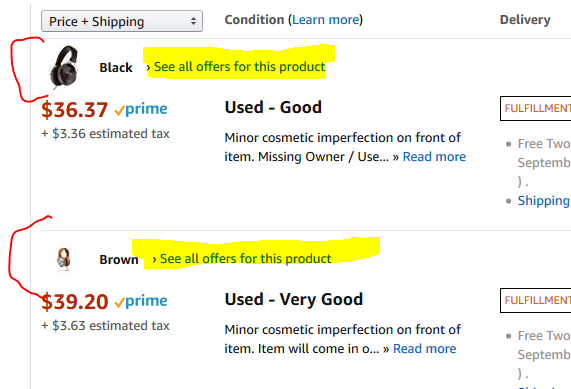 If you don’t want to wait that long and instead prefer the 2-day Prime shipping, they are available in Used condition for $17~ (“Good”) and for $19~ (“Very Good”) by Amazon Warehouse Deals actual (Prime eligible). They average 4.5 out of 5 based on 32 customer reviews. A lot of things are marked “DJ” for marketing purposes, but this is a real DJ bundle at Adorama.com, it is the Sennheiser HD8 DJ headphones along with the Pioneer Electronics DDJ-SX2 4-Channel Performance Serato DJ Controller, together for $999 with free shipping. This bundle offer expires 5/17/16.